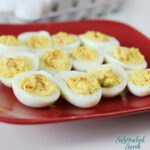 Are you on the search for the perfect Deviled Eggs Recipe? Search no more! This classic appetizer is just the thing for your Easter table, summer potluck, or family gathering! I love sharing easy appetizer and snack recipes! Some of our favorites include Crockpot Cheesy Bacon Dip and Easy Slow Cooker Grape Jelly Meatballs. These appetizers are terrific for a gathering or picnic. Today I’m excited to share another of our favorites! 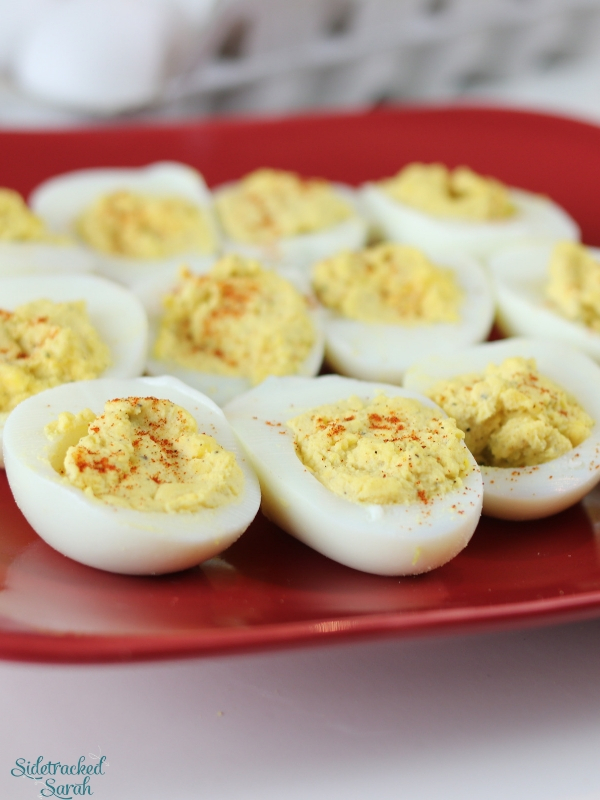 Deviled eggs are kind of a staple for most holiday tables and potlucks. They’re one of those recipes that you’ve had your entire life, so they ought to be easy to make, right? Not always. As easy as they might seem, there are a lot of little things that can wrong when trying to make deviled eggs. The shells can be difficult to peel, the yolk can turn odd colors, or the filling might not have that creamy, bright yellow consistency we all love. Never fear, though. I’ve got you covered! This is my go-to recipe, and I’m excited to share it with you! CAN I BOIL THE EGGS IN ADVANCE? Making Deviled Eggs doesn’t have to be difficult, but it is a bit time-consuming. 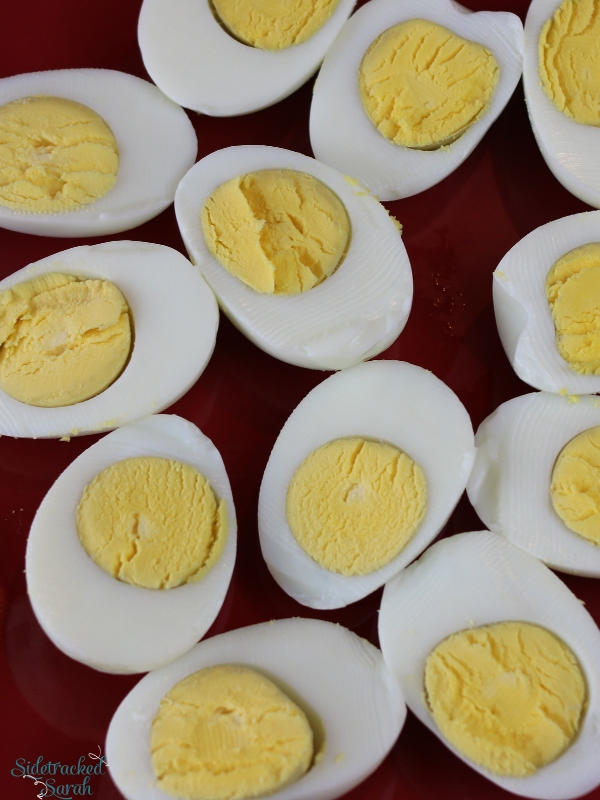 If your schedule is busy and you can’t do it all at once, you can boil the eggs up to 2 days in advance. Just let them cool, seal them in an airtight container or freezer bag, and keep them in the refrigerator until you need them. HOW DO YOU MAKE THE EGGS EASY TO PEEL? One of the biggest complaints I hear about making Deviled Eggs is that the eggs can be hard to peel. Not only does this make the process take longer, but the eggs just aren’t as pretty when there are chunks missing from them! There are a few things you can do to make them easier to peel. When you remove the eggs from the boiling water, put them into an ice bath immediately to stop the cooking. Wait until the eggs are cool, rather than trying to peel them while still hot. This will not only stop them from overcooking, it also will cause the air pocket between the shell and the egg white to separate more cleanly. This helps to make peeling a breeze! Also, boiling your eggs in the Instant Pot can often help make them easier to peel. Just one more reason to love this handy appliance! CAN I PREPARE DEVILED EGGS IN ADVANCE? I don’t recommend fully preparing the Deviled Eggs more than a few hours ahead of time, but you can prepare the whites and filling up to two days in advance. Once you peel them, slice them in half and remove the yolk. Wrap all of the whites in plastic wrap and seal them in an airtight container or freezer bag in the refrigerator. The filling can also be prepared up to two days in advance and kept refrigerated in a freezer bag. When you’re ready to prepare the Deviled Eggs, just snip off a corner of the bag. You will have a ready-made piping bag to pipe the filling into the whites for a beautiful presentation! WANT MORE EASY RECIPE IDEAS FOR YOUR NEXT GATHERING? Once eggs have cooled completely, peel them and slice them in half lengthwise. Remove the yolk and place it in a bowl, along with the rest of the ingredients. 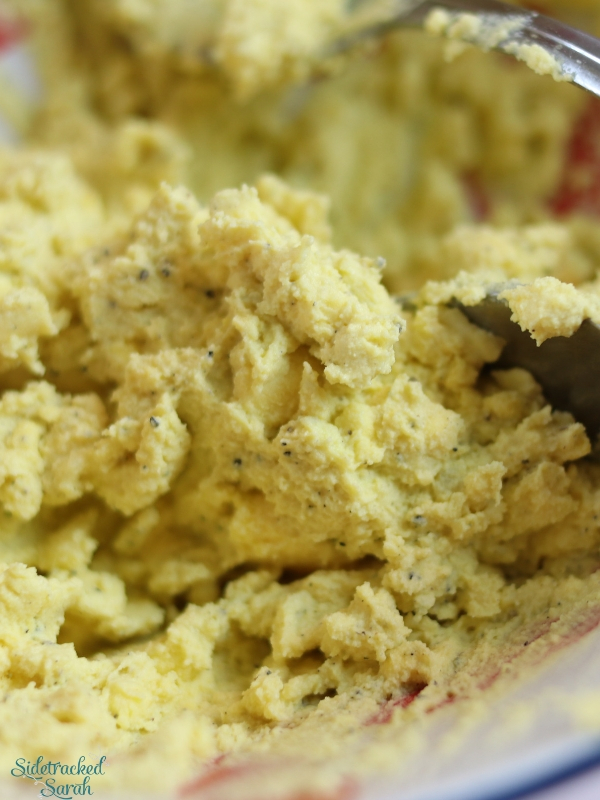 Mash yolks and other ingredients together until it makes a smooth paste and all ingredients are evenly distributed. Spoon the mixture back into each egg half. For a nice tasty look, sprinkle a bit of paprika over the top of each egg.